2018 review by Guy Loveridge. When a competition car achieves a major race win it is usually celebrated in the short term. But, when a car achieves something unique, such as winning the World’s greatest Race – the Le Mans 24 Hours, back to back, then it passes into folk law. 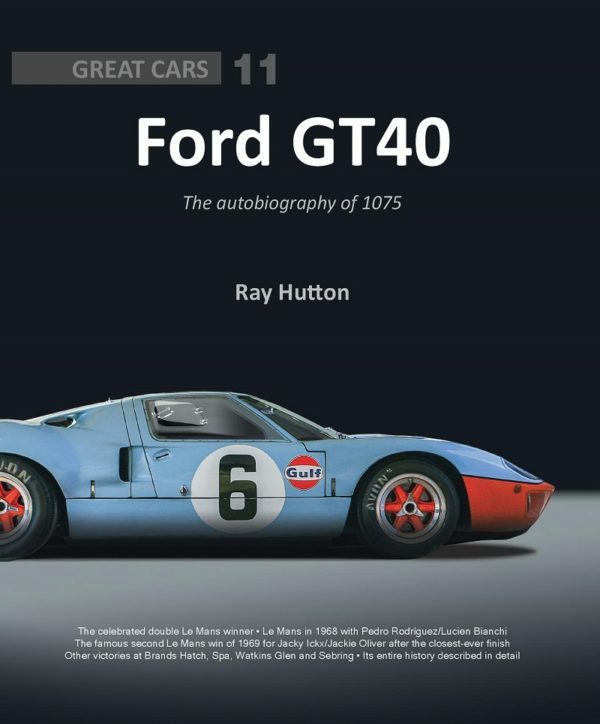 That the GT 40 which took victory at La Sarthe in 1968 and 1969 should have a book dedicated to it exclusively is something that ticks the “About Time” box if you are, like me, a fan of Ford’s Ferrari challenger. This work, by hugely respected scribe Ray Hutton traces the entire history of the this chassis, before and after its two epochal and historic Le Mans outings in minute detail and places the achievement of JW Automotive operation and the Gulf Team in perfect period context. If you have any passion for motor racing in the 1960s this is an absolute MUST for your shelves, and if as I say, you think the GT 40 was simply “the business” in that era, you will likewise ensure you secure a copy. It is, in this reviewer’s humble opinion, right up there with Ronnie Spain’s legendary title on the Ford sports racer. Heartily commended without reservation. Price: £60. 320 pages (291mm x 243mm), hardback in dustjacket.